New Zealand is known for its great scenery and New Zealanders are known for an appreciating it. In response to the local love for the great outdoors, the New Zealand government maintains a collection of trails and huts for hiking (called ‘tramping’ in New Zealand), including nine Great Walks. Great Walks are well-travelled and well-maintained, and there are options for hikers of all skill levels. 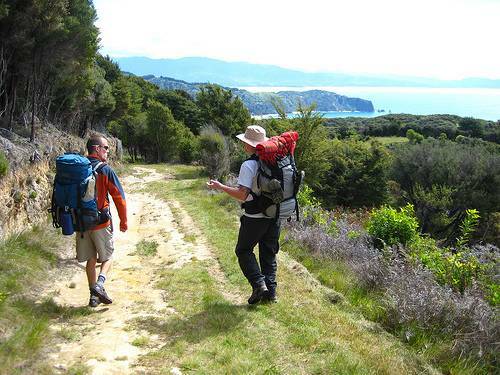 Your best resource for planning a Great Walk in New Zealand is the Department of Conservation (DOC). DOC operates a comprehensive website with information on trails and places to stay along the journey. Be sure to use this resource to plan your trip. Unlike other backcountry tramping opportunities in New Zealand, you must book your huts and campsites in advance during the summer season. Due to the popularity of these walks, the DOC prefers to limit the number of people on the trail and in the huts per day, which requires a little forward planning from hikers but ultimately results in a more enjoyable experience. This North Islands walk follows the shore of Lake Waikaremoana. This 46 km walk takes most trampers 3-4 days to complete. Most hikers leave their cars at Waikaremoana Motor Camp And then return via water taxi from the end of the trail. This track is a 3-4 day tramp, taking hikers 50 km around the base of Mt. Ngauruhoe. This tramp is more challenging than the other Great Walks and should not be attempted by hikers with low levels or fitness or experience. The best time to go is in the summer when track conditions are good. Rainfall can negatively affect the trails. Located in Abel Tasman National Park, the Abel Tasman Coast Track is an easy 3-5 day walk along a magnificent coastline. Trampers will see golden beaches, granite outcroppings, lush rainforest and quiet streams. The scenic beauty of this track makes it one of the greatest draws of Tasman tourism. The Heaphy Track is the longest Great Walk and takes most people 4-6 days to travel the full 78.4 km. The trail runs through a variety of scenery, and you’ll experience ancient beech forests, limestone caves, alpine plains and wide rivers. The Routeburn is one of New Zealand’s most famous walks, and taken hikers through the scenic Southern Alps. It takes about 3 days to complete the track, and there are three huts available to stay in along the path. For a longer journey, it is possible to add the Routeburn onto the Greenstone or Caples tracks. Milford Track is arguably the most popular of the Great Walks and is heavily regulated by DOC. Only 90 walkers are allowed to begin the trek each day during the peak season and those spots are often booked months in advance. The track goes over rainforests, wetlands and alpine landscapes. Like the Milford Track, the Kepler Track is located in Fiordland National Park. This track takes 3-4 days to finish and goes through some stunning areas, including lakes, gorges and rainforests. The track is a loop, beginning in Te Anau, making for simple transportation and accommodation before and after the hike. The Rakiura Track is a circuit around Stewart Island. The track usually takes three days to complete from either direction. In addition to a tour of Stweart Island, this is your best opportunity to see kiwi in their natural habitat. The Stewart Island kiwi are diurnal and live in family groups, making them easier to spot than other types of kiwi.